Dull or yellow teeth can be a source of embarrassment and low self-confidence. A bright and dazzling smile can significantly impact your image and how you present yourself. We all want a movie star-like smile, but unfortunately, that’s not the case for the most of us. Of the four tissues, enamel and dentin are responsible for the colour of your teeth. Due to ageing and consumption of certain foods, the enamel starts breaking down, revealing the inner dentin. This exposes the dentin layer, causing your teeth to appear yellow or dull in colour. Plaque is the sticky colourless bacteria that forms on the surface of your tooth. It is developed when food particles are left on the teeth. Plaque produces acids that harm the white enamel layer of your tooth, and hence, reveal the yellow dentin. When you don’t brush, floss and rinse adequately, plaque and other staining substances like coffee are not removed, resulting in tooth yellowing. If plaque is allowed to stay on your teeth for a long time, it calcifies and forms tartar or calculus. To remove tartar, you will need a professional dental cleaning. 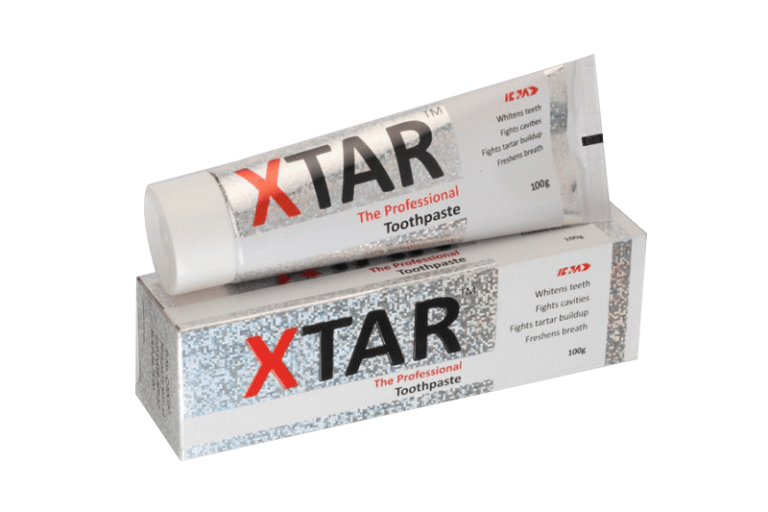 However, by using a specialized toothpaste like XTAR, you can control tartar build-up. If you have suffered from a dental injury as a child, it can disrupt enamel formation. Since enamel is the layer responsible for the white colour of your teeth, your teeth look yellow. Some antibiotics like tetracycline and doxycycline can cause discolouration of the teeth when prescribed to children under the age of 8. In adults, antihistamines like Benadryl, high blood pressure medication and antipsychotic drugs can also cause teeth discoloration. Overexposure to fluoride during the formative years under the age of 8 is called fluorosis. Teeth affected by fluorosis can appear mildly discoloured or have lacy markings. While this kind of discolouration can only be noticed by dentists, in some cases, stains can be yellow or dark brown. If your family members have yellow teeth, then it is likely that you have yellow teeth as well. This is because some people have thinner enamel, which makes their teeth appear yellow. Similarly, some people can have thicker enamel that makes their teeth appear whiter. How to Prevent Yellow Teeth? Coffee, tea, soda, and wine can stain the enamel of your tooth, giving them a dull appearance. While completely avoiding these foods may not be an option for many, even reducing their intake can make a difference. Moreover, habits like chewing tobacco and smoking also cause staining. So, quitting tobacco use is not only beneficial to your overall health, but also to the appearance of your teeth. As mentioned earlier, it may not be possible for you to stop consuming some beverages. But, what you can do is immediately drink water after ingesting a tooth-staining drink. Swirling water in your mouth, washes away the stains and acids, reducing tooth discolouration. Poor oral hygiene can lead to a number of dental problems including yellow teeth. When you don’t follow a regular dental routine – brushing, flossing and rinsing – the plaque and tartar build-up increases, causing tooth discolouration. How Can You Whiten Yellow Teeth? Having a beautiful smile is easier than you think. There are many professional treatments that dentists offer that can brighten up your face. Another option is to go for aesthetic treatment at home by using over-the-counter tooth polish like Shine-N-Smile. Such tooth polishes have mild abrasives like sodium monofluorophosphate that remove the surface stains from your tooth. As the stains are removed, your teeth look whiter. However, it is recommended that you should use this tooth polish only twice a week and on the other days, brush with your regular toothpaste. Always take care of your teeth by maintaining proper oral hygiene and taking precautions to keep your teeth white. Everything You Need to Know About Denture CareWhat Causes Gum Disease and How to Prevent It?